Lego The Lord of the Rings is a Lego-themed family-friendly action-adventure video game developed by Traveller’s Tales, that was based on The Lord of the Rings film trilogy. The game follows the original but spoofed story lines of The Fellowship of the Ring, The Two Towers, and The Return of the King, and utilizes music and voice acting taken from all three films of the film trilogy. The Lego The Lord of the Rings video game has received critical acclaim for its addictive game play. It’s available for Nintendo 3DS, Nintendo DS, Sony PlayStation Vita, Microsoft Windows, Nintendo Wii, SonyPlayStation 3, Microsoft Xbox 360, and macOS (Mac OS X). Usually costs $19.99, you can now a free copy of Lego The Lord of the Rings full version game on Windows platform, through Steam. Humble Bundle is offering the full game of LEGO Lord of the Rings for free when you subscribe to Humble Bundle newsletter. To claim the deal, visit the Humble Bundle’s Lego The Lord of the Rings game page to complete the sign up and checkout. 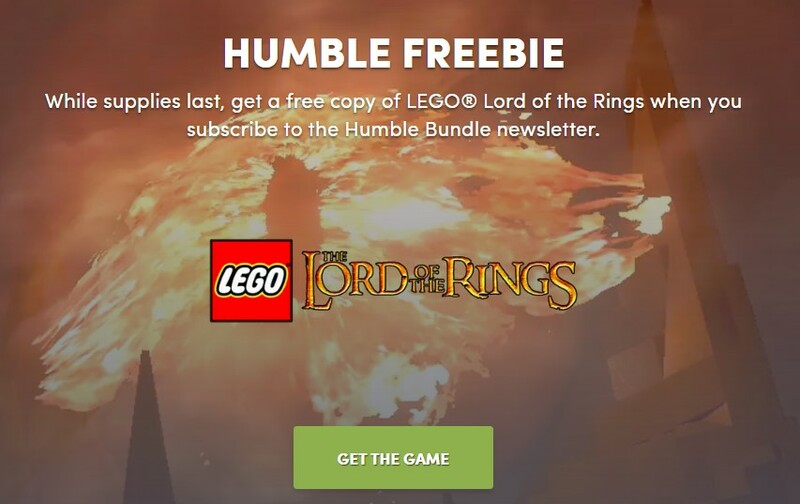 The free Lego The Lord of the Rings game by subscribing to Humble Bundle newsletter offer is valid for a very limited time only, specifically until December 22, 2018 at 10 am Pacific time or when supplies run out. You need a Humble Bundle account to claim the free game, in addition to subscribing to newsletter. In addition, the activation of the game is done via Steam, so you have to have Steam account too. Note that you must claim the Steam key on Steam by December 27th, 2018 at 10 am Pacific time. The Steam key could be revealed from your Humble Library.